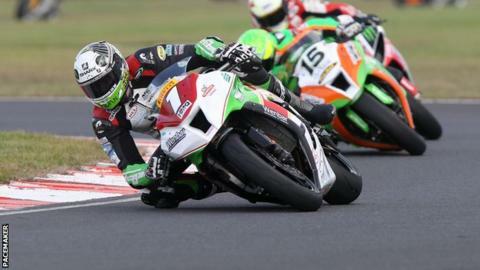 Essex rider Danny Buchan is set to face a strong challenge as he defends his Sunflower Trophy title at Bishopscourt. Among Buchan's competitors on Saturday will be newly crowned British Superstock 1000cc champion Josh Elliott and Tyco BMW entrant Alastair Seeley. Keith Farmer will join Elliott in the Morello Racing team for the Superbike events, while Jamie Patterson will be on board the Wilson Craig Honda. Glenn Irwin will ride for his Gearlink Kawasaki team at the County Down event. The meeting will represent the Carrickfergus rider's last outing for the team as he has signed to compete for the Paul Bird Motorsport Ducati team in British Superbikes next season. Elliott, 21, from Ballinamallard, succeeded Buchan in securing the Superstock crown and will be strongly fancied to challenge strongly for the major prize on offer. Former Irish Superbike champion Nico Mawhinney will also take his place on the grid, while Farmer switches to a Tsingtao Racing MV Agusta for the Supersport outings. British Superstock 600cc rider Andrew Irwin is also in action at the County Down track on Luke Hedger's Gearlink Kawasaki, with his brother Glenn and Ben Wilson expected to be among his main competitors. Lee Jackson is set to be on the grid in the colours of the Buildbase BMW team while a host of Irish championship regulars, including Ryan Rainey, David Haire, Robert English and Nikki Coates will be hopeful of making an impact. Portadown rider Marshall Neill, who was due to compete at the event, has withdrawn and is understood to be contemplating retirement from the sport after 16 years in the saddle. Meanwhile, in the smaller classes, William Dunlop is entered on the Joey's Bar 125cc Honda. The meeting constitutes the final round of the Irish and Ulster Short Circuit Championships, with practicing taking place on Friday 23 October.